Nvidia G Sync has been all the news lately, and due to good reason too : G Sync will apparently end all Lag/Tearing/Stutter. However AMD has been unusually silent about this and speaking fairly, what really can you reply to an innovation like G Sync. 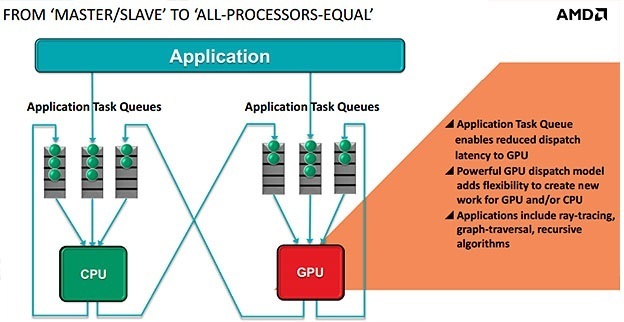 Well AMD might have an answer of its own: Heterogeneous Queuing. Basically here’s what heterogeneous queuing will do. As you may know the CPU and GPU work together to process this thing called Games. However the relationship is far from equal. The CPU is the undisputed master. It controls itself, and dispatches ‘orders; for the GPU. However the ‘orders’ tend to get an inevitable delay since they travel through the OS and Kernel Drivers before arriving to to the GPU. 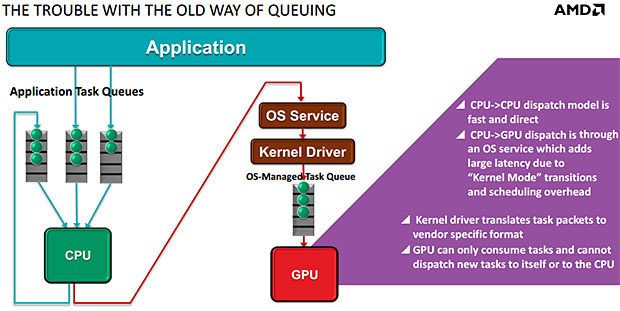 Naturally the GPU cannot create ‘orders’ for the CPU, since it can hardly create tasks for itself. However AMD aims to end GPU Slavery Once and for all. With all the changes in the air with G-Sync , Mantle and now Heterogeneous Queuing we here at WCCF that the tides are a changing. With the stacked DRAM and 1 TB worth of Bandwidth on the horizon with Volta, the future is getting more powerful by the second. AMD’s HQ wil allow an Application to dispatch work directly to the CPU and the GPU without interference from the OS. We are interested to see if AMD will possibly utilize this with the Low Level Access provided by Mantle. Anyways, with Hq the GPU and CPU will work as a team, equal in every right. The GPU will be able to create work for itself and for the CPU and vice versa. Basically AMD is reinventing and rethinking the Co-Processor.